The Eleventh Doctor and Alice Obiefune arrive in late 19th Century San Francisco to find mechanical automatons roaming the streets. They investigate with the locals, but they don’t discover anything of interest until a police officer comes and shows them the way to the factory. Unfortunately, the cop isn’t what he seems, and the Doctor and Alice wander into a trap. 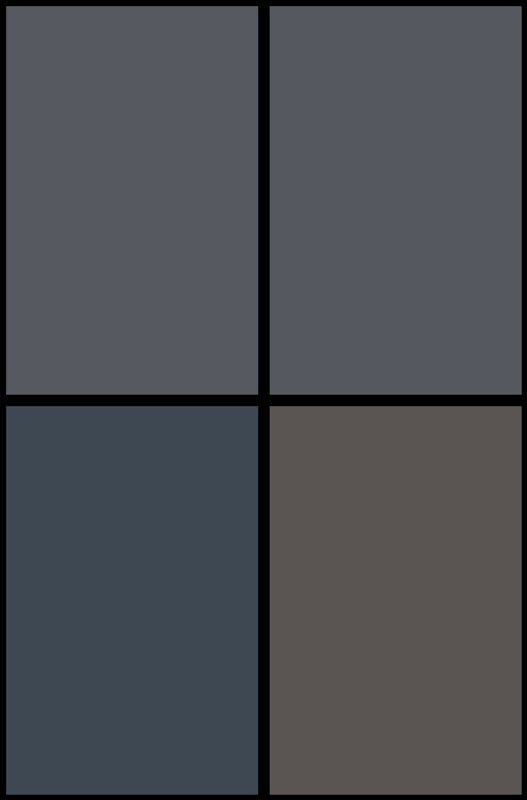 In a back-up story the Doctor sits bored while Amy and Rory observe the black cubes. The Tenth Doctor issue was a disappointment in how it displayed something of a parody of David Tennant’s Doctor. 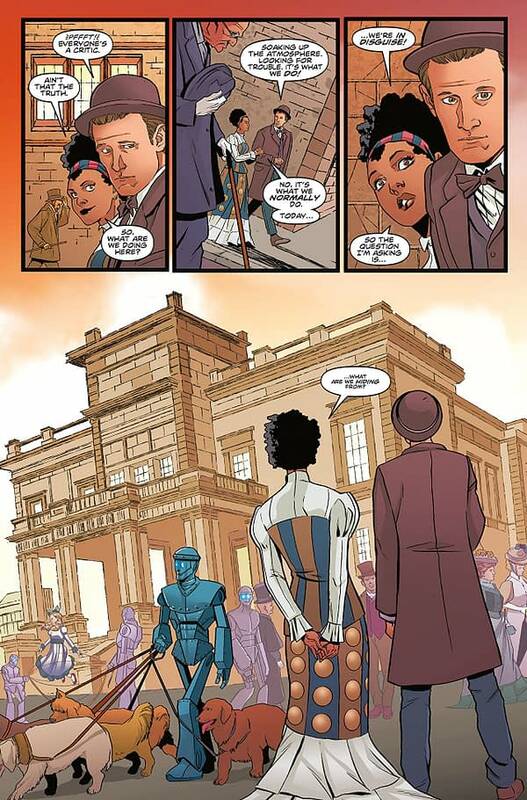 This issue does give into some cornier moments, but it’s on the whole a far better depiction of Matt Smith’s Doctor. He’s fun, energetic, and a little child-like. The story is still a simplified version of a Doctor Who story—though a 20-page comic isn’t as much space as one or two hour-long television episodes. The conflict is resolved shortly after the Doctor and Alice discover it. The sonic screwdriver is almost a cure-all in this comic. My biggest criticism is that the Doctor pretty much gets a butler killed by one of the mechanical soldiers, and there is never sign of remorse, sadness, or really any second of introspection. The back-up story is a good bit of fun though, even if it is really intended to be more of a snapshot of the Eleventh Doctor’s tenure. Pasquale Qualano’s artwork serves the comic well. 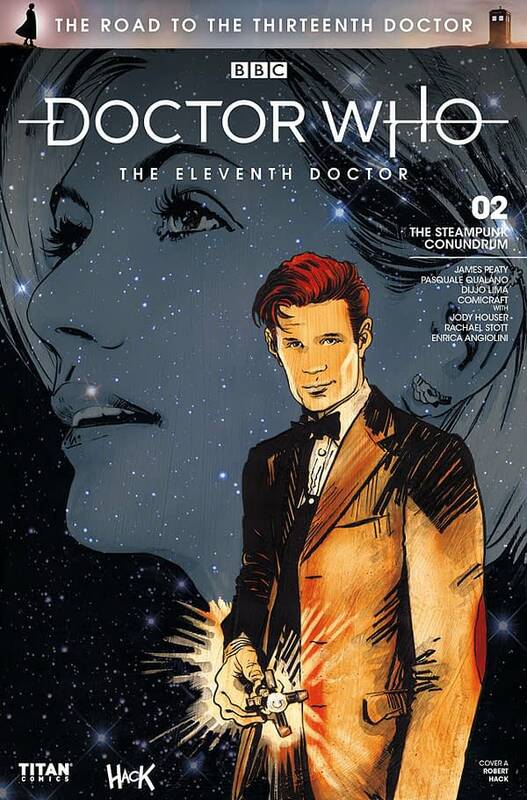 The detailing is really good; the Doctor looks exactly like Matt Smith in this comic. The design on the mechanical soldiers is good, and the main villain has a nice design reminiscent of the X-Men villain, Nimrod. 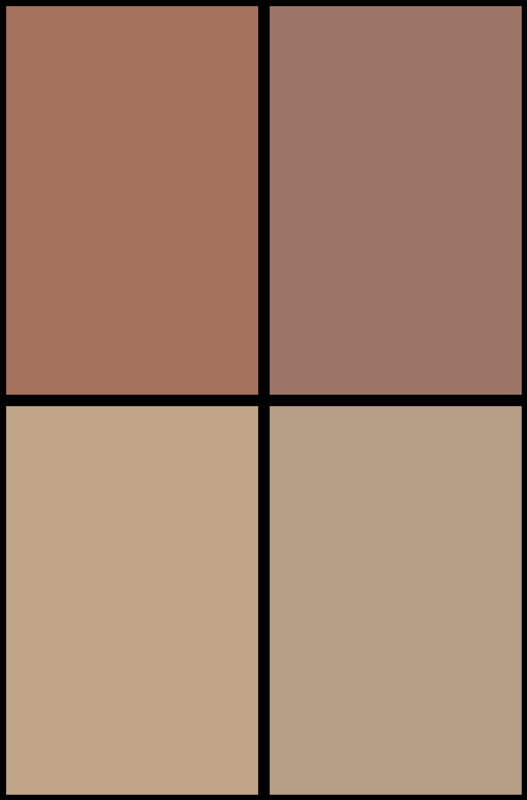 Dijjo Lima’s color palette is cooler in this comic and has better contrast than in the Tenth Doctor issue. Rachael Stott and Enrica Angiolini do some awesome work in the backup story once again. Doctor Who: The Road to the Thirteenth Doctor- The Eleventh Doctor #1 is an enjoyable adventure starring the Matt Smith Doctor and one of his companions from the comics. The pacing is breakneck, but there is enough fun content so that you don’t feel short-changed by the end. This one gets a recommendation. Feel free to check it out.